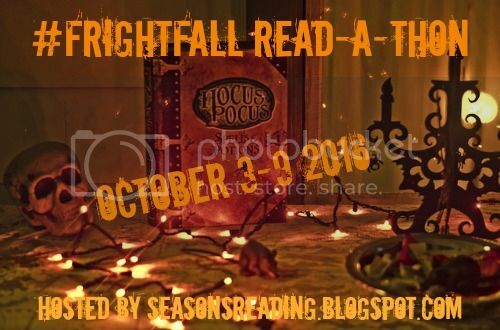 The FrightFall Read-a-thon is hosted by Seasons of Reading and runs from October 3rd-9th. I have a huge list of books to get through this fall, so I thought this would be a good way to knock out a few! I'm going to aim for 4 books, which is ambitious for this slow reader. To 'complete' the read-a-thon, we have to read one 'scary' book (paranormal, Gothic, thriller, horror, etc) and then can read whatever we want for the rest of the week. Do you like scary books? I'm a total weenie when it comes to scary stuff, but I love paranormal and will read the occasional horror or thriller. Do you have any favourites? I love scary books. Looks like you chose some good reads for the readathon. Enjoy! Hey, Marie...your host here. Welcome to FrightFall. :-) As you probably figured, I'm a huge horror fan. My favorite horror novel is Hell House by Richard Matheson. I'm also a big Anne Rice and Stephen King fan. Favorites by them...her Vampire Chronicles, Queen of the Damned specifically. His Bag of Bones, Duma Key and The Stand. (If I HAVE to pick favorites for them. lol) I'm reading King's Salem's Lot right now. I hope you enjoy your selections this week! Should have also mentioned that I love your blog look. Your header is gorgeous!